While more than a thousand films are made in Europe each year, only around 20 actually circulate in any meaningful way outside their own national market but within Europe. Despite the processes of globalisation and digitisation, we are clearly still some way from a film industry that knows no borders. This paper analyses the sorts of European productions that do travel successfully within Europe, and why. It draws on research undertaken for the MeCETES project (Mediating Cultural Encounters Through European Screens, 2013-2016), and especially the extensive database of films released in Europe between 2005 and 2015 put together by Huw D. Jones. The key factors affecting the ability of European films to travel successfully in nonnational European markets include the size of the budget, whether one of the major American studios was involved as producer or distributor, whether the lead producing nation was one of the Western European big five, the language in which the film was shot, critical acclaim, and the way in which the film tells its story. Five categories of European films, their production circumstances and their market performance, emerge from this analysis. First there are large-scale, big-budget blockbusters, many of them inward investment films backed by the Hollywood majors, which tend to travel well within Europe and enjoy equivalent success online. Secondly, there are small-scale, director-led, art-house films that command significant critical attention and travel to cosmopolitan audiences across Europe. Thirdly, there are feel-good, middlebrow films that occupy the middle-ground between these two extremes: modestly budgeted films that occasionally achieve crossover success and travel well within Europe. The other two categories describe films that travel very little, if at all, outside their domestic market. The fourth category is modest to low budget films with a strong national appeal, which may be successful in their own domestic market but rarely travel well beyond that market, whether theatrically or online. Fifthly, there are a great many European productions that fail to secure significant national admissions, let alone admissions in non-national markets. In many cases, this is indeed about failure. The dominance of the European film market by a small number of powerful American, British and French companies, and to a lesser extent, German, Spanish and Italian companies, indicates a lack of diversity within the films that circulate. And while some European films do circulate successfully outside their main producing nation, the vast majority do not. National film cultures within Europe are also surprisingly resilient in this era of globalised, digital storytelling and a surprising amount of national film-making is still enjoyed by national audiences. The challenge to policy-makers thus remains to find more effective ways of enabling a greater degree of cultural exchange, openness and inclusivity, within and beyond Europe. This article seeks to explain why some non-national European (NNE) films – i.e. films produced in one European country but released in another (e.g. a French film released in Italy) – are more successful at the Italian box office than others. Drawing on theories about the transnational circulation and reception of films and other media products, along with a range of qualitative and quantitative methods and sources, I compare the cultural and industrial characteristics of ‘successful’ NNE films (i.e. films that achieved 200,000 cinema admissions or more in Italy) with ‘unsuccessful’ NNE films released in the period 2005-15. My analysis reveals that few of the NNE films which succeeded at the Italian box office have characteristics we would expect to find in films that travel well across national borders. Indeed, most are low-budget independent arthouse or middlebrow films with stories that are dialogue-heavy, complex and culturally specific. Nevertheless, these films perform well not only because they appeal to audiences (particularly university graduates) who watch films for their cultural or artistic value, rather than purely for entertainment, but also because these successful arthouse and middlebrow NNE films have other key characteristics which ensure they receive widespread distribution and thus higher audiences. These characteristics include major awards, positive reviews and the involvement of international stars, critically-acclaimed directors, or pre-sold material (e.g. based on a bestselling book). Since most of the NNE films which succeeded at the Italian box office also performed well in other European countries, these findings can be applied to other national contexts. That said, there are some attributes of the NNE film market in Italy that are specific to the Italian context. For example, arthouse NNE films tend to perform better in Italy than countries like the UK, partly because such films are dubbed rather than subtitled, and partly because arthouse distributors and cinemas have a larger share of the theatrical market, though there are signs this is changing. This article begins with the observation that, in the era of media convergence and abundance, the consumption of audio-visual media occurs in such a fragmentary and ‘informal’ way that to speak simply of ‘distribution’ is no longer sufficient. Though it remains relevant – as demonstrated by the continued centrality of the box office – this term implies a vertical, closed economic process which overshadows other viewing processes (institutional and non-). The article thus proposes adopting the term ‘circulation’, which instead would allow scholars to map out the movement of audio-visual products in various (geographic, technological) contexts, in order then to question cinema’s cultural impact in a broader and more exhaustive way. Following a theoretical reflection on circulation and the conception of national cinema, the article reflects on the case of Italy. The discussion then presents the results of a quantitative analysis of box-office data – which is justified as a fundamental starting point for reflections on circulation. The second and third parts illustrates the shortcomings of Italian cinema in particular from a comparative perspective, identifying the potential successful circulation models, and national cinemas within the European Union. The fourth examines the European markets where Italian cinema finds the most significant audiences, thus signalling its various strategic circulation patterns. 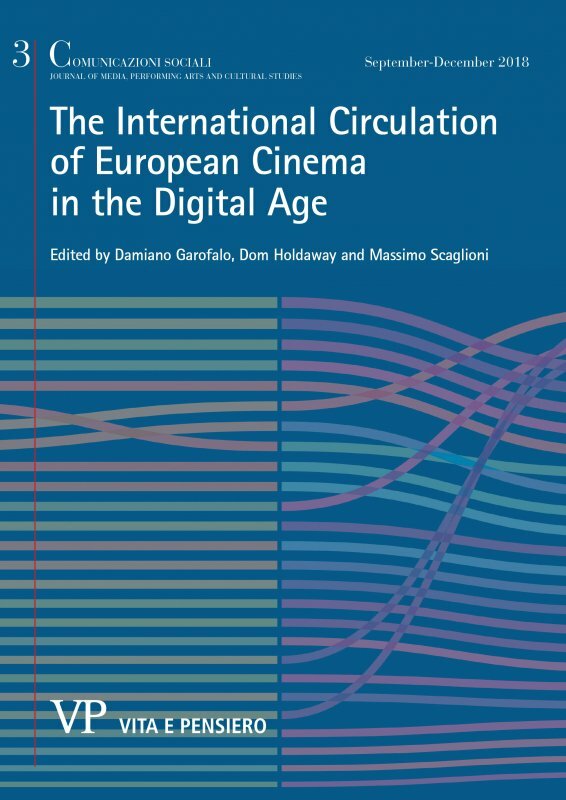 This article proposes to analyse the forms of circulation of Italian cinema abroad through a survey of its critical reception in the main international reviews in France and the United States. In particular, we have pursued the mapping, the cataloguing and the digitization of articles from the journals Cahiers du cinéma and Positif for France and Film Comment for the USA, covering the decade 2007-2017, in order to build a digital database. Thus, we have collected a selection of the data provided by the specialized press about the spread and promotion abroad of Italian national cinematographic culture. Such data allows us to emphasize some pivotal stakeholders in the circulation and valorization of Italian cinema through critical reflection, reviews, and interviews. Moreover, the journals offer a selection of Italian titles within the home video market, and a mapping of the initiatives of programming and curatorship in the institutional frameworks of cinematheques and museums. We have carried out quantitative analysis of the number of articles dedicated to Italian cinema, and qualitative analysis, of the relationship between ‘auteur’ cinema and popular films, of those titles that have been dramatically re-evaluated, those less well-known in Italy but much appreciated abroad, or those subjected to harsh criticism. This essay will address the dissemination of contemporary Italian cinema in North-American theatres. In the first part, it provides an overview of theatrical circulation strategies over the past few decades, offering a historical perspective on the economic and cultural distribution processes of Italian cinema in the United States. In the second, the article focuses on quantitative data in order to examine how many and what kinds of Italian films were distributed in American theatres over the past ten years, as well as their admissions and box office takings. Specifically, this contribution focuses on the two Italian auteurs who obtained the most visibility in the US thanks to the distribution of 4 of their films between 2008 and 2017: Paolo Sorrentino and Luca Guadagnino. In order to define two different distribution models, we will identify the promotion strategies of the most widely circulated films directed by these auteurs: La grande bellezza/The Great Beauty (2013) and Youth (2015) by Sorrentino, and Io sono l’amore/I Am Love (2009) and A Bigger Splash by Guadagnino. In the final section, we relate these cases to the historical circulation patterns of Italian cinema. This essay investigates the presence of Italian cinema in United States television schedules (on networks as well as basic and premium cable channels) and in the libraries of America’s main on-demand digital platforms. It maps the spaces that are currently available, the national films screened, and the ways and forms in which they are presented to audiences. The analysis raises theoretical and methodological questions on the importance (and yet the difficulty) of understanding the specific role of television and the digital media in film distribution after the theatrical release, while offering perspectives on the main routes by which Italian films are made available, presented and contextualized for US viewers. The purpose of this article is to analyse the role played by the category of ‘nationality’ in global SVOD (Subscription video on demand) services by looking at Netflix and its presence in the European context, with a focus on two key audio-visual markets such as the British and Italian ones. We argue that the persistence of the concept of ‘nationality’ on streaming services, albeit arguably marginal, suggests a new understanding of its function within contemporary media conglomerates. More in particular, the analysis of the presence of national productions in the British and Italian Netflix catalogues focuses on their availability and discoverability, considering what features the SVOD service finds pertinent to assign a ‘national’ belonging, and how such a ‘label’ of nationality works to guide the user within the catalogue. The question of availability, therefore, frames the idea of national from a production perspective, engaging with elements of cultural policy and EU protective measures. The discoverability instead dictates a pragmatic or consumption-based approach, encouraging an understanding of the concept of national for its function as identifier in the labelling, tagging and categorisation of online catalogues. On the one hand, this approach re-establishes all the complexity, the fluidity, and the mutable persistence of the national concept in media production, circulation, and consumption. On the other, it shows that the idea of national plays a marginal role in the discoverability of the Netflix catalogue, and that a global ‘portal-as-brand’ strategy definitely prevails over ‘nation-as-brand’ strategies. blockchain than cryptocurrencies. One could argue that a primary purpose of this technology is to create a fair economic future, though more practically it could also be used to promote and distribute heavy files, such as films. There are several advantages that this technology could therefore bring. Blockchain can provide economic, artistic and cultural improvements, especially in countries with smaller cinema industries, which are ruled mainly by government subsidies – as in several cases in Europe. The focus of this article is on some of the main problems that cinema has faced in most European countries, mostly due to legislation, and how blockchain could resolve many of those issues. This research reveals the many issues raised by laws: the definition of a film’s authors changing from country to country; mismatches between legislation and the reality of the film industry; the delegation of impractical tasks to entities of collective rights management; legal complexities that prevent users from understanding clearly if they are committing an illegal act; the works’ excessive costs in relation to its purchase or to rights acquisition for its use – and part of the profits not going to the authors nominated by law; the possibility that not all of the work’s owners are recognized by law, and soon. This article references and explains the expropriations generated by the current legislation of Author’s Rights and Related Rights of the EU, and illustrates the solutions that blockchain technology could provide. On January 18th, a shooting occurred in an upper middle class private school in the city of Monterrey, Mexico, by a 15 year old student of that institution. As soon as the news coverage started, it reported contradictory data mixing both formal and informal sources. The purpose of this article is to show the evolution of this coverage through the spatial frames given to the event during the first week after the incident, and reflect over the vulnerability that each frame has in making mistakes. This article analyzes the follow-up to the story in four news portals based on Iris and McComb’s categorization of the spatial (individual, community, regional, societal, international). A total of 275 articles were collected from four of the main local news portals, along with other national and international press articles. The main findings show that most mistakes were made at the individual level, due to the lack of official statements during the first hours after the shooting. Community and Regional frames were the most popular since they made the story relevant to a bigger audience, involving families, citizens and other social groups. The societal level was used mostly for opinion articles, where different political debates were raised and questioned regarding children’s mental health, weapons license, and new projects such as “Operación mochila”, related to the backpacks checkups at schools. The growing need to be the fastest one to get things published, due to the immediacy of online mediums, pushes journalism to be unverified and careless. This causes a higher probability for mistakes or factual errors, as in this case, which are later echoed by other newspapers, channels and portals. One of the main conclusions calls for a reflection on the responsibility of local press, especially when they become the main source for national or international press. The increasingly worsening threat posed by terrorism in Europe has led the media to focus their attention on the issue of violent radicalisation. Although this phenomenon includes different forms of violent extremism – from extreme right-wing movements to catholic movements, eco-terrorists, etc. – today the question of violent radicalisation is mainly related to Jihadism, and ISIS is the most recent and, from the perspective of its media use, intriguing expression. However, radicalisation is a debatable topic whose dramatic consequences invite a deeper analysis of both driving and enabling factors. Within theoretical debate, there is the well-known querelle between Oliver Roy (2016) and Gilles Kepel (2016), two French authors who underlined several factors. These include ISIS’ ability to persuade its martyrs, thanks to a skilful use of aesthetic codes of modernity to spread the underlying principles of an obscurantist interpretation, or the role of Salafism in enlarging the gap between the second and third generation immigrants and western societies, those considered the manifestation of moral and spiritual decadence. Furthermore, social relations established on Internet, group dynamics and the inclination to crime have been interpreted by Anglo-Saxon scholars as enabling factors (Neumman, 2013, 2015, Berger & Stern 2015; Klausen 2015). The essay presents the key findings of qualitative research carried out within the EU SAFFRON Project. The empirical research included seven focus groups in Italy and France which involved 47 individuals: 17 experts or qualified testimonials and 30 young people (age between 16 and 32) selected among second and third generation immigrants, political refugees, university students from Iraq, Pakistan, Senegal and Iran, secondary school students, and Italian youths converted to the Muslim faith. The theme of motivations or driving factors has been analysed using a participatory approach aimed at studying in depth the main rhetoric and narratives of online propaganda spread by the ISIS organisation for the purpose of recruitment. Research findings identified some specific factors as crucial: for example, the role of social media considered by young people as reliable sources of information versus mainstream media, which described as responsible for the dissemination of false stereotypes related to Islam; the theme of pseudo-heroism as promoted by skilful storytelling techniques; the patriotism which drives young immigrants and refugees to “take a position” in relation to conflicts in their countries of origin; and even existential and identity problems – almost always intertwined with the religious dimension – that apparently find an easy and immediate solution in the choice to radicalise. There has been a growing interest in the study of performing arts audiences over the last three decades. This interest is expressed both at an organizational level, by the increasing presence of audience development and audience engagement initiatives, and within the expanding multidisciplinary field of academic research on theatre audiences, which interweaves economics, cultural marketing, the sociology of culture and audience studies applied to theatrical reception. To some extent, such attention is guided by the need for organizations and institutions to compete in increasingly competitive culture markets. It is however also the expression of a rising awareness of the social impacts that art consumption has on the processes of citizenship, community welfare, urban regeneration, political participation and on the struggle against social exclusion. Starting from the introduction of a theoretical framework that unites studies on theatre audiences, audience development and reception processes, the article presents the results of national survey dedicated to the Italian audiences of contemporary and experimental theatre. The purpose of this study is to provide a preliminary profiling of the audience of a branch of performing arts with its own specificities in terms of aesthetic, productive and distributive features. To this aim we also stress the importance of the dialogue between audience research and theatre studies to evaluate the perimeter of the field of the ‘contemporary’. Hence, the present research starts from the process of self-observation of spectators, having asked audience members to define themselves as ‘frequenter of contemporary and experimental theatre’, ‘non-frequenter’ or ‘uncertain about the attribution’. In this way it has been possible to trace homologies and divergences between habitual and occasional audiences, in order to describe attitudes, motivations and attending behavior on the basis of the different degrees of affection and competence towards this cultural sector.The analysis of the data follows the different areas investigated in the questionnaire, presenting a socio-demographic profile of the audience, attending behavior, the attitudes towards the artistic proposals, the relation between the enjoyment of contemporary theatre and other cultural and media consumption routines. It is therefore possible to observe a type of audience with certain specific characteristics: they tend to be competent and willing to accept the challenges of artistic innovation (with certain complaints); they are dynamic and generally omnivorous regarding cultural consumption. In our country the conditions for women have radically changed over time thanks to a number of important achievements. However, several discriminatory factors still exist, such as the multiple roles (wife, mother, employee) that women must carry out, or salary gaps between men and women. On top of this we can add the persistent attitude the media takes in defining and assessing the value of a women. This is primarily based on the concepts of beauty, youth and slenderness, all of which make female bodies instruments of passive obedience in a patriarchal order of things. In advertising particularly,in addition to recognizing the natural inclination that women have to taking care of their bodies, women are constantly represented in a ‘neo cubist’ way – with value given to specific parts of the body rather than to intellectual capabilities. Based on an analysis of a significant body of television commercials and of a number of recent studies carried out on this subject, this article addresses the following questions: does current advertising empower women or reinforce old stereotypes? Can we find examples of advertisements that represent women performing intellectual or professional roles or are we still seeing women in domestic environments or as objects of pleasure? Findings indicate that the ‘empowerment’ that the media claims it is representing is really just a ‘power’ or ‘freedom’ that women are offered from a menu of mostly old stereotypes.